Variety reports that yet another game is going to suffer the attempt at movie-transformation. We all know few have successfully made that transition - MAX PAYNE being the most recent example. In any event, Hollywood continues to try. EA already has titles like THE SIMS, MASS EFFECT, and BIOSHOCK signed over to various studios for development. Apparently, Universal Pictures is "fast-tracking" this particular property...which I doubt is a good thing in terms the quality of the final film, but they did hire Scott Burns (The Bourne Ultimatum) to write the script. It will be interesting to see what they do with the music for these films. 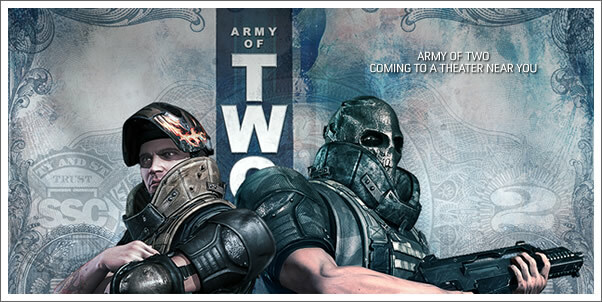 For ARMY OF TWO, Will they be true to composer TREVOR MORRIS' original score or go a completely new direction? Perhaps a better question is SHOULD these movies stay true to the games' original music? What do you say?